The Division of Aquatic Resources collects various types of data for use in monitoring, assessing, managing, and protecting the freshwater aquatic resources of the State. It does this through Division surveys: point quadrat count method, drift sampling, larval trapping and other scientific surveys (insects, algae) by other institutions or organizations. The point quadrat count method is a survey of the stream’s biota. It includes native and exotic species of fish, crustaceans, mollusks, insects and algae. It also describes the site’s habitat type, substrate type, survey area, temperature and elevation. The Division of Aquatic Resources Freshwater Database contains survey data from the States’ perennial and intermittent streams, reservoirs, lakes, ponds, ditches, and diversions. The data dates back to the early 1960s and includes data from the Hawaii Stream Assessment (HSA) developed as a cooperative project of the Commission on Water Resource Management, Department of Land and Natural Resources, the National Park Service Cooperative Park Studies Unit at the University of Hawaii, and the National Park Service Rivers, Trails and Conservation Assistance Program in 1990. Finding data on a particular stream or body of water is based on an address or code. The Division of Aquatic Resources’ coding of all segments and tributaries of Hawaii’s 376 perennial streams is based on the seven-digit Hawaii Stream Assessment (HSA) code (0-0-00.00.0). 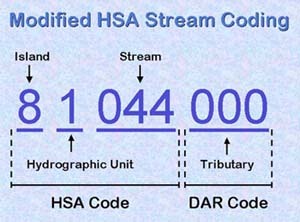 The DAR codes for the streams are similar to the first four digits of the HSA code (0-0-00.00.0) however an extra digit was added to the stream section of the HSA code in order to incorporate intermittent streams and drainage basins that would be added at a later date. The DAR code is a straight eight-digit number (00000000) without any dashes or periods, which converts the codes from a text to a numeric field to facilitate quick data sorting and querying in an Access database. The second digit identifies the HYDROGRAPHIC UNIT (Hgu_code) 00000000 within each island. These units are regional drainage area established in the 1970s by USGS and DOWALD. Download a map showing islands and hydrographic units (PDF). The third through the fifth digits identify the STREAM (Stream) 00000000. Expanded to 3-digits to incorporate intermittent streams and drainage basins at a later date. The coding of the intermittent streams and drainage basins will probably start from the last number where the perennial streams left off for that island and continue clockwise around the island. The sixth through the eighth digits identifies individual TRIBUTARY SEGMENTS (Tributary) 00000000. Codes for the islands and their hydrographic units are necessary to know prior in finding a specific stream by its “Name”. If the stream is a first order (no tributaries), you can search the DAR stream database using the stream name. However, if you’re looking for specific tributaries you will need to know the tributary name for that stream. Once the first search by either stream or tributary name is accomplished, then you’ll need to know what island and hydrographic unit the stream or tributary are located on. Then, by highlighting either the correct HSA_code or DAR_code field and choosing the funnel function on MSAccess toolbar, the database will remove data not relevant to your query. For stream names reference United States, Department of Interior, Geological Survey; Topographic quadrangle maps, 7.5 minute series, 1983.